Pt. 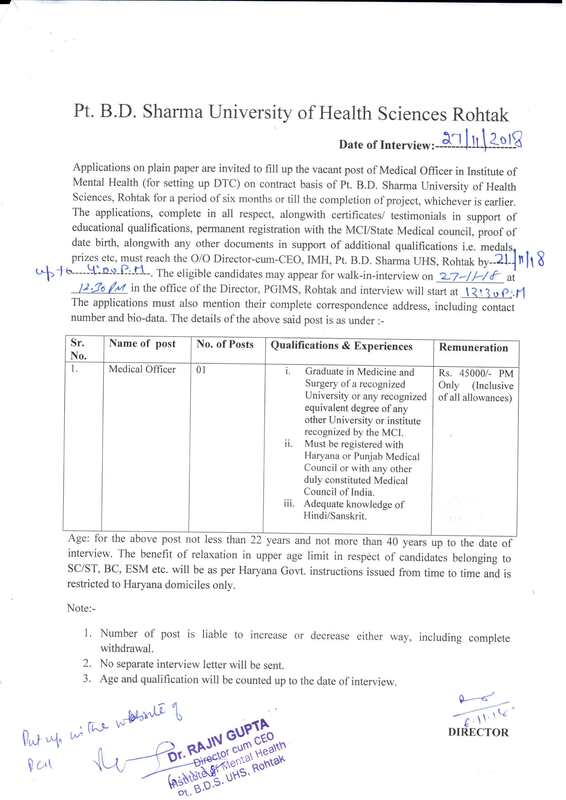 B.D Sharma University of Health Sciences, Rohtak (PGIMS Rohtak) is conducting recruitment to fill the posts of Senior/Junior House Surgeon for a period of 6 months. Educational Qualification: Candidates must possess MBBS from a recognized University by MCI with registration as Haryana Medical Council and must have completed Internship. Fee: General candidates have to pay of fee Rs. 500/-, Rs. 125/- for SC/BC candidates from the counter of the office of the Director (Accounts Branch). How to Apply: Eligible candidates may send their bio-data, along with relevant certificates of testimonials, recent passport size photograph on or before 30-11-2018 by 05.00 p.m. Date & Time of Interview: 14-12-2018 at 10.00 a.m.
Pt. B.D Sharma University of Health Sciences, Rohtak (PGIMS Rohtak) is conducting walk-in-recruitment to fill the posts of Medical Officer on contract basis. Age: Candidates age must be in between 22 to 40 years. Educational Qualification: Candidates must possess Graduation in medicine from a recognized University. How to Apply: Eligible candidates may attend the interview with bio-data, along with relevant certificates of testimonials, 2 copies of recent passport size photograph on 27-11-2018 at 10.00 a.m.